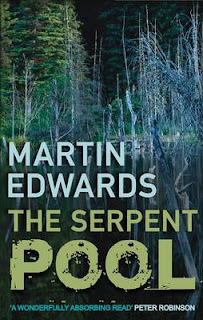 With so many translated crime novels appearing these days, I find it hard to keep up with my British favourites which is why I've only just read The Serpent Pool by Martin Edwards which came out last year. (His next book, The Hanging Wood is to be reviewed shortly on the website by Maxine). 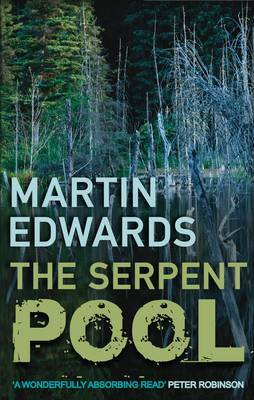 The Serpent Pool is the fourth in the atmospheric and enjoyable Lake District series which has two lead characters: Daniel Kind an Oxford-educated historian who has left the big city for the charms of the country and whose father was a policemen in the area before he died, and Hannah Scarlett who heads up the Cold Case team and used to work for Daniel's father, Ben. Hannah's latest cold case investigation is into the suspicious death of English student and hopeful writer, Bethany Friend who was found drowned in the Serpent Pool, which happens to be close to where Hannah and her partner Mark have moved to. The prologue describes to the reader, the murder of a book collector but this death is also put down as suspicious rather than murder by the police. Meanwhile Daniel is preparing a book on Thomas De Quincey, the 19th Century author of On Murder Considered as one of the Fine Arts, and also will be giving a lecture at the upcoming De Quincy festival, in addition his sister has moved to the area and her new boyfriend is another book collector. Steadily all the different threads mentioned above begin to overlap and form a web and a cruel picture emerges. As usual, I found myself absorbed by this latest addition to the series. I'm there in the Lake District, tootling around Ambleside, and I can picture it all. Plus I really I want to find out what's happening to Daniel and Hannah who have a relationship of friendship but are destined for something closer (eventually one hopes). For me, the mysteries took a bit of a back-seat to all the relationship issues this time round but I was sad to finish it. For an absorbing British crime novel series, set in one of the country's most beautiful tourist destinations, with some historical facts woven in, I recommend you start with The Coffin Trail and continue. Don't just take my word for it, read Maxine's Review. More reviews and a bibliography of Martin Edwards' books can be found on the Euro Crime website. Karen - Thanks for sharing your thoughts on this - a fine review :-). Like you, I really do get caught up in the lives of the "regulars" in this series, and I agree that Edwards does an excellent job of evoking the setting, too. And then there's the mystery itself... Folks, I recommend the series very much, but Karen's right; starting with The Coffin Trail will make the series come alive even more. I can't read this series without shouting out "Hannah dump that creep Marc". I get so involved which is a tribute to Martin's shrewd writing. The Serpent Pool kept me guessing until the end, and shows that the good old English detective story still has lots of life left in it if the characters are interesting. Thanks for this upbeat review, Karen. Martin is an author whose books have already caught my eye. The TBR pile on my desk is the only reason I've not taken the plunge. I'll take your advice and read them in order. Thanks for the review, I have ordered the sameple of the coffin trail onto my kindle so I can check them out from the start! Excellent review, Karen. Yes, I don't get why Hannah puts up with Marc, really. Maybe she'll dump him soon. The Body Farm - Coming Soon to BBC1?